What does a white reflector (cat's eye) on the road mean? What does a white reflector (cat's eye) placed on the road mean? What does a white reflector (cat's eye) placed on the road mean? Correct. A white reflective stud marks the centre line. You can use it to judge your position on the road and keep left. New Zealand conforms to the same standards as the UK and Australia on the positioning of road studs by using white studs to mark the centre line of a single carriageway, or to delineate lanes on a dual carriageway or motorway. Why do we use cat's eyes on the road? 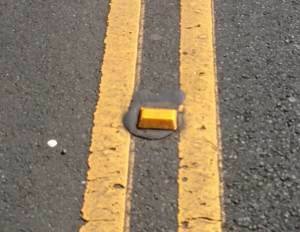 Cat's eyes are also called road studs or retroreflective raised pavement markers (RRPMs). There are several types of cat's eyes used on the roads in New Zealand and they serve three purposes. Visual lane marking - using white in the middle and red on the left edge means that road users can follow these to stay in the lane. Using yellow where there are yellow no overtaking lines add visual reinforcement to the rule. Special feature marking - fire hydrants are marked with blue road studs and, in some areas, culverts and drains are marked with green road studs. The following photo shows a yellow road stud between double yellow no overtaking lines.